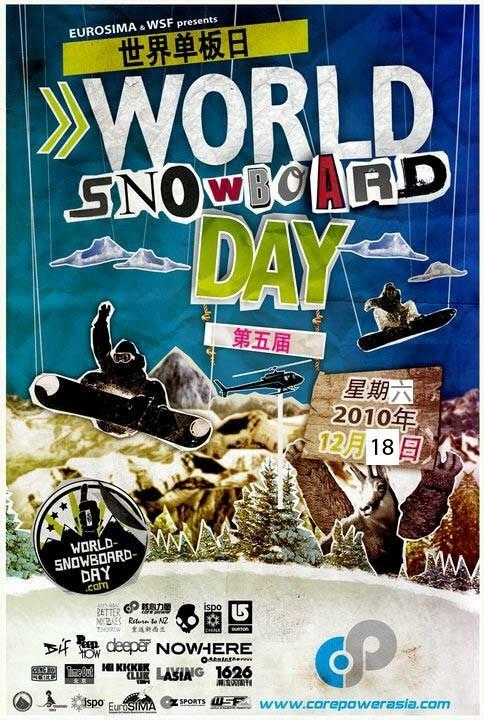 We invite you to celebrate the World Snowboard Day 2010 on Saturday, December 18th 2010 at Dolphin sports bar and grill in Sanya, starting at 8pm. World Snowboard Day (WSD) is the largest snowboard event in the world. It is a unique concept of snowboarding, a free and open day to celebrate snowboarding everywhere in the world. In 2009 in its fourth year, 34 countries and 139 resorts participated in this event. This also marked the first time when China joined the international snowboarding communities in their effort to spread the word! Wang Lei, China’s top snowboarder, once again patrons World Snowboard Day in China and lends his valuable insights and influence towards the event for an even greater success. With more than 1850 activities organized and nearly 70.000 participants, the World Snowboard Day has become in only 4 years, an event of reference for the international snowboard community. All participating resorts will grant free access for all snowboarders, the program and WSD activities vary from resort to resort! We are currently working on the details of the program in resorts across China! Stay tuned on www.corepowerasia.com for updates and details about this exciting snowboard season highlight! World Snowboard Day China is brought to you by Burton Snowboards www.burton.com and supported by ISPO and ISPO China and Skullcandy. Special thanks to our media partners Living Asia Channel (Satellite and webTV), 1626, Time Out Beijing Chinese language and www.KickerClub.com. World Snowboard Day China by Burton – a Core Power Asia event production www.corepowerasia.com.